Just because it's now officially fall in my part of the world doesn't mean that we're required to break out our deeper, spicier fragrances right away, right? Not when there's still a fresh crop of pink perfumes in pink bottles to be sampled! I tried two new-ish ones this week, with mixed results. 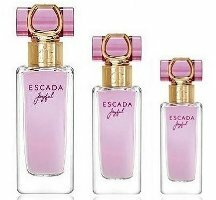 Escada hasn't released anything but upbeat fruity florals in a long time, and Joyful fits the usual profile. I have to say, however, that I liked this one much less than Especially Escada Delicate Notes. That one was an inoffensive sheer rose scent; this one is much fruitier, and just feels somehow blunt and sour. The melon and blackcurrant are initially noticeable, but they become less distinct from one another as the fragrance develops and the whole "fruit" concept takes on the generic quality of an air freshener. The florals are barely detectable to my nose. The dry down adds a soapy musk to the fruit-mix and (wouldn't you just know it?) lasts a long time on skin. Basically, Joyful feels oddly joyless to me, and just about as synthetic as the accompanying commercial and print ads — their final image evokes New York's Central Park carousel, but the footage was actually shot on Roosevelt Island, on a merry-go-round set built near the former Strecker Memorial Laboratory. Why didn't the Escada team decide to film in the real Central Park, or otherwise just do the whole thing in a studio? Why do I even wonder about things like this anymore? Meanwhile, Italian luxury brand Fendi has released Fan di Fendi Blossom, a flanker to 2010′s Fan di Fendi. Fan di Fendi Blossom is packaged in a pink-ified version of Fan di Fendi's chic double-F bottle, and its composition includes notes of cherry blossom, pear, raspberry, pink pepper, jasmine, magnolia, vanilla and white musk. Fan di Fendi Blossom smells slightly ozonic when sniffed straight from the bottle, but on paper it behaves more like it should. Its opening is a radiant cluster of grapefruit and rose notes, boosted by the pink pepper. The pear (specifically, "Nashi pear") has a melon-like tinge, and the pink-and-white floral notes are pale and slightly sharp. This fruit-and-flower blend reminds me for a while of some shampoo scents, because it's so bright and clean; then it loses some color and dries down into a lightly vanillic skin-scent base. It's definitely "front-loaded" to appeal to potential customers at the perfume counter, and it's less interesting as it unfolds. This fragrance appears to be aimed at a "youthful" customer who likes office-friendly, non-gourmand florals; you'll probably enjoy it if you're a fan of L'Occitane's various Cherry Blossom scents or any number of mass-market best-sellers like the Marc Jacobs collection. In fact, I could pretty much re-use Robin's summary of Marc Jacobs Lola here: "Like so many of the department store fragrances released over the past few years, [Fan di Fendi Blossom] smells instantly familiar, and it no longer seems worth taking the time to figure out just which other fragrances it smells like." As for me, I personally prefer "regular" Fan di Fendi. Actually, I truly prefer the original Fendi fragrance fragrance, a spicy heavy-hitter from the 1980s, but that one is gone forever. Perhaps Fendi's Furiosa, scheduled to be launched later this fall, will appeal more to my own tastes. Have you tried either of these fragrances? What did you think? 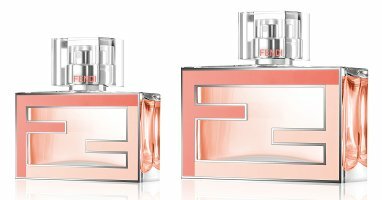 Escada Joyful is available in 30 ($52), 50 ($68) and 75 ($89) ml Eau de Parfum; Fendi Fan di Fendi Blossom is available in 30, 50 ($71) and 75 ($86) ml Eau de Toilette. Have you tried Fendi Asja? That and Theorama are the two Fendi scents that I admire. Palazzo was pretty good, too. Thank you for the review and I wish you happier smelling. Hello! I wish I’d given Palazzo another chance. I loved the bottle… I just wasn’t in the right mood for it, I think. But I do like Fan di Fendi (a fruitchouli, but a nice one)… and I’m curious about Furiosa! It’s spring where I live and the weather is marvellous. It makes me long for pink perfumes in pink bottles but sadly, it’s not a genre I’m normally drawn to and I own almost none. Laura Biagiotti Roma might be the closest. Of course I own plenty of green, spring like fragrances, but the day seems call for pink! Escada does do great pink ads. Pretty girls in gardens next to rose-studded hedges. They make me smile, although I have tended to assume, cynically perhaps, that the ads are better than the perfumes. Oh, EL’s Beautiful. That’ll do. Pink for women, not girls. I actually do own/love many fragrances that could be described as pink. I was just thinking of Annick Goutal — Petite Cherie is a delightful fruity-flower fragrance for “youthful” moods. Quel Amour! is my favorite AG — pink peonies and roses and berries. I was also going to mention MCMC Phoenix somewhere in the review, as a good fruity-floral alternative to mainstream “pink” fragrances. I like and own Petite Cherie and MCMC Phoenix. Hi Jessica! Fun to see your review now that we’ve met in person. I long for post-summer pink but these do sound disappointing. In the “not gonna take the time” category. I found an original Fendi perfume in a thrift store once – makes you realize exactly how not worth the time their current releases are. It was extraordinary. A nose full of interesting. Perhaps I will now get out my Undergreen Pink. UC, now you can “hear” the writing as well as read it. My mother wore that original Fendi for a while, and although I was young(er), I thought it smelled great. It really fit the brand’s identity at the time. Undergreen Pink is a wonderfully weird take on pink! Enjoy. UnSeen – re: the new releases – I couldn’t agree more. I wore the original Fendi, and it was spectacular. The new releases are just not comparable. I admire you for reviewing these. The only Escada scent I ever owned is Rockin’Rio. Very trashy, but good fun nevertheless, as it is utterly unpretentious. It was in the days before I became a serious parfumista! I put some on, actually the other day and to my surprise I still enjoyed it. This made me laugh! I, too, owned Rockin’ Rio, it’s the only Escada I’ve ever owned, and it was also before I really got into perfume. Admittedly I’d been in the mood for something “slutty” when I bought it. That is a fun one. I bought a cheap decant for a young cousin recently, and was tempted to keep it for myself. It is fun isn’t it. Very lighthearted and cheerful. Why, oh why, is Escada making all these scents when all they should do is re-release Collection? Thanks for the reviews , Jessica. Your nose took the punishment so mine didn’t have to. Oh, Collection! I remember when everyone was crazy about Collection. I still have a carded sample vial somewhere… I’ll have to dig it out.